Art galleries in Ankara, a directory (no hyperlinks). Art galleries in Turkey, a name and address directory without web links. The Museum and Contemporary Art Centre on the Golden Horn in Sütlüce. Turkish artists and where their art can be viewed in art museums worldwide. The Site of Ancient Halicarnassus. Turkish cinema, an introduction from The Turkish Culture Portal. The rise of Turkish contemporary art. GlobalPost article and video. As the most extensive modern and contemporary art event in Turkey, Contemporary Istanbul aims to promote the cultural and artistic life of Turkey. Sürekli ve süreli sergiler, videolar ve sinema filmleri sunmaktadır. Turkey’s first modern art museum, is housed in an historic building and provides a general overview of a small portion of the prolific oeuvre of Burhan Dogançay, one of Turkey’s leading artists. cultivates innovative programs for research and experimental thinking. Phoenix with roses. 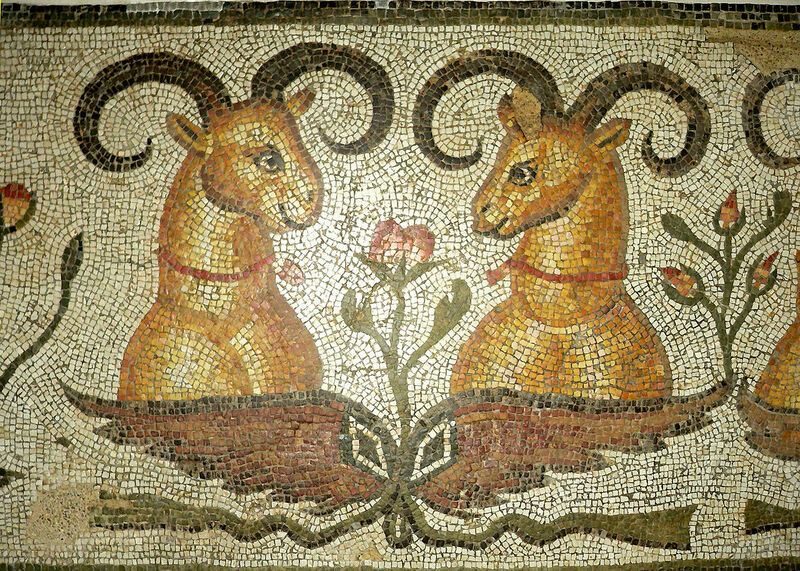 Pavement mosaic (marble and limestone), 2nd half of the 3rd century AD. From Daphne, a suburb of Antioch-on-the-Orontes (now Antakya). A carefully curated site by The Turkish Cultural Foundation. Art, literature, crafts, performing arts, architecture. hosts the Elgiz Collection at the main exhibition hall. The Elgiz Collection consists of international and local established and emerging artists. The project room of the museum, called Artvarium, hosts temporary exhibitions to support contemporary artists. Ephesus, a panoramic tour of the ancient city. History, information and pictures of Ephesus. Fairs, festivals and events in Turkey. A guide from All About Turkey. As the most extensive “modern and contemporary art” event in Turkey, Contemporary Istanbul aims to promote the cultural and artistic life of Turkey. Fabrics and patterns in Turkey. An overview from The Turkish Culture. The Kariye Camii, with its glorious mosaics and frescoes, holds an important place in the hearts of many lovers of old Istanbul. For four days, Contemporary Istanbul hosts national and international galleries, artists from all over the world, collectors, museum directors, curators, art critics, members of press and art lovers at Istanbul Convention and Exhibition Center (ICEC). Elgiz Museum of Contemporary Art Istanbul. Hagia Sophia was a Greek Orthodox Christian patriarchal basilica (church), later an imperial mosque, and is now a museum (Ayasofya Müzesi) in Istanbul. Turkish painters, traditional arts, exhibitions. ArtInternational launched in September 2013 at the Haliç Congress Centre in Istanbul. Bringing together leading international and local galleries, this leading modern and contemporary art fair in Istanbul offers access to new art from Turkey, Europe, the US, the Middle East and beyond. The Istanbul Foundation for Culture and Arts (İKSV) was founded in 1973 with the goal of offering the Turkish public opportunities to experience the finest examples of cultural and artistic production from around the world. In addition to organizing festivals, biennials and events in Turkey and abroad, the Istanbul Foundation for Culture and Arts is involved in conserving traditional arts and cultural heritage. İstanbul Museum of Modern Art. A guide to the collection from Google Arts & Culture. A quarterly online literary magazine in which you van find short stories, poetry and articles. Galata Tower, Tugra of Sultan, the Golden Horn, etc. An Istanbul art museum in an ornate former hotel offering painting, ceramics & rotating shows of modern masters. SALT explores critical and timely issues in visual and material culture, and cultivates innovative programs for research and experimental thinking. Physical theatre and new media. The Istanbul Museum of Modern Art, Turkey’s first private museum to organize modern and contemporary art exhibitions, was founded in 2004. Its vision is to collect, preserve, exhibit and document works of modern and contemporary art and make them accessible to art lovers. The Museum of Innocence is both a novel by Orhan Pamuk and a museum. From the very beginnings of the project, since the 1990s, Pamuk has conceived of novel and museum together. The novel, which is about love, is set between 1974 and the early ’00s, and describes life in Istanbul between 1950 and 2000 through memories and flashbacks centred around two families – one wealthy, the other lower middle class. The museum presents what the novel’s characters used, wore, heard, saw, collected and dreamed of, all meticulously arranged in boxes and display cabinets. (iS.CaM) is an independent, artist-run museum established in Istanbul in 1997. It develops, evolves and collaborates with other institutions and networks. Borusan Contemporary is a museum and a multi-platform program of exhibitions, events, educational initiatives, new commissions and site specific installations rooted in the Borusan Contemporary Art Collection. The entire building including the galleries, office space, café, BC Shop and outdoor terraces with breathtaking views of the Bosphorus are open to the public on the weekends. Santral Istanbul is an international platform for arts, culture and learning. It has hosted many national and international exhibitions since opening. A private collection of contemporary art. The museum displays Orientalist paintings and Ottoman artifacts, but also modernist works by artists such as Picasso, Botero and Chagall. The Web Biennial ( WB) is an online Art exhibition of of net-art. It is organized by Istanbul Contemporary Art Museum. Karagoz traditional Turkish shadow theatre. Monuments and memorials in Turkey. This Monument is situated on the north side of the Domitian Square. It was constructed during the reign of Augustus in the 1st century A.D. The Pera Museum is the first step of a comprehensive cultural endeavor which the Suna and İnan Kıraç Foundation has launched at this venue in Istanbul for the purpose of providing cultural services on a variety of levels. Performing arts in Turkey, from The Turkish Culture Portal. Travel and information guide to Turkey.